Our DeLonghi ECAM22110SB Review will demonstrate why the Magnifica XS is an espresso machine worthy of your money. Don’t be fooled by this unit’s compact size. It’s capable of making the same drinks as machines twice its size (and price). This automatic machine can produce espresso, cappuccino, latte and macchiato at the push of a button. It looks gorgeous and has an outstanding track record. 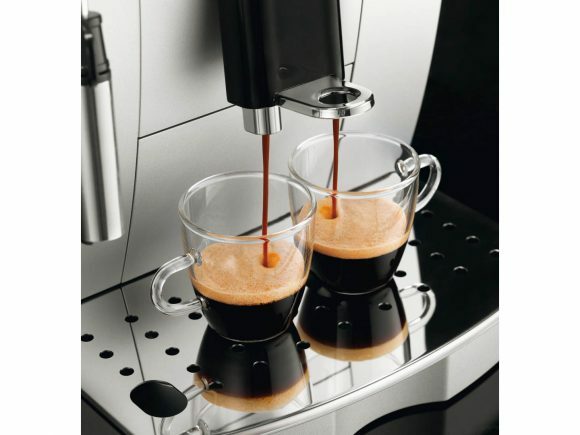 This espresso machine has received top ratings for quality, reliability, and performane. 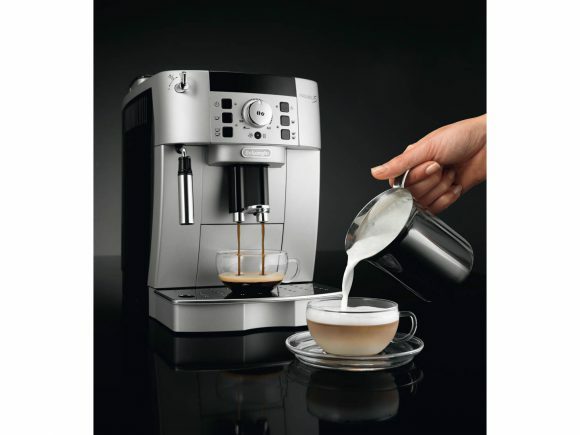 Included with purchase is a 2 year warranty from DeLonghi which is twice as long as the industry average. Let’s have a look at some of this product’s features below. A frother located on the front of the machine mixes steam and milk to provide you with a creamy froth. Custom settings allow the user to specify their drink’s strength, temperature, and size. The settings can be saved for future brewings to provide a consistent drink time after time. A burr grinder integrated into this machine grinds beans to your liking. 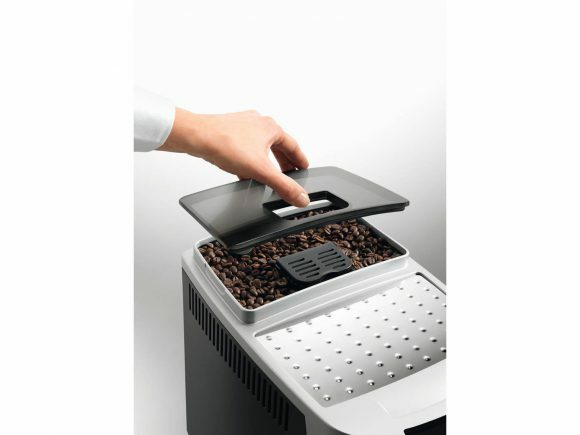 Choose from 13 different settings to determine how finely to grind the beans. In addition, there is a second compartment to use pre-ground beans if you desire. The height adjustable head allows the user to move the head based on the size of the cup(s) beneath it. It has the ability to brew two cups at a time. This unit is extremely intuitive with its user-friendly menu settings. Alter the unit’s settings with a simple push of a button. An integrated Rapid Cappuccino System maintains a consistent temperature to instantly brew drinks without any down time. This machine is very easy to break down and clean. The water reservoir, drip tray, and used grounds can all be easily accessed from the front of the machine. The water reservoir can hold a half gallon of water before needing to be refilled. It also has an indicator light to warn the user when the water level is getting low. Indicator lights located on the front of the machine alert the user when it’s time to clean the unit. All parts of this machine are dishwasher safe. 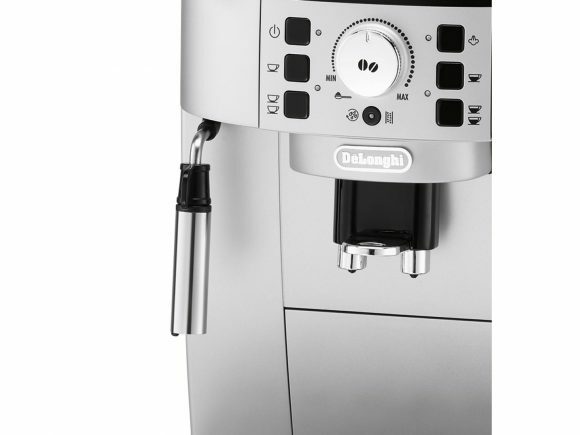 This DeLonghi Espresso Machine measures 16.9″ wide by 13.8″ high by 9.4″ deep and weighs 19.8 lbs. Amazon reviewers have show a lot of love for this espresso machine. 76% of people have given this unit a 4 to 5 star rating. People love the automated nature of this machine. They like how they can simply push a button and have their drink brewed before them. They also love the brewing speed. The pre-heat function allows the user to brew a cup of their favorite drink in a matter of seconds. Reviewers have expressed their appreciation for the smart nature of this machine. They are able to select the settings for their drink and have it instantly replicated without any effort on their behalf. Most importantly, purchasers have stated that this unit produces phenomenal tasting drinks. The machine has far exceeded their expectations and they are quite satisfied with their purchasing decision. Reliability has been a big area of praise. Users have noted that they have been using this machine for years without any hiccups. It continues to produce consistent drinks with no signs of letting up. People state that the indicator lights on the front of the machine make it very easy to maintain. Lastly, people like how easy the unit is to clean. The automatic cleaning and descaling program makes cleaning a breeze. 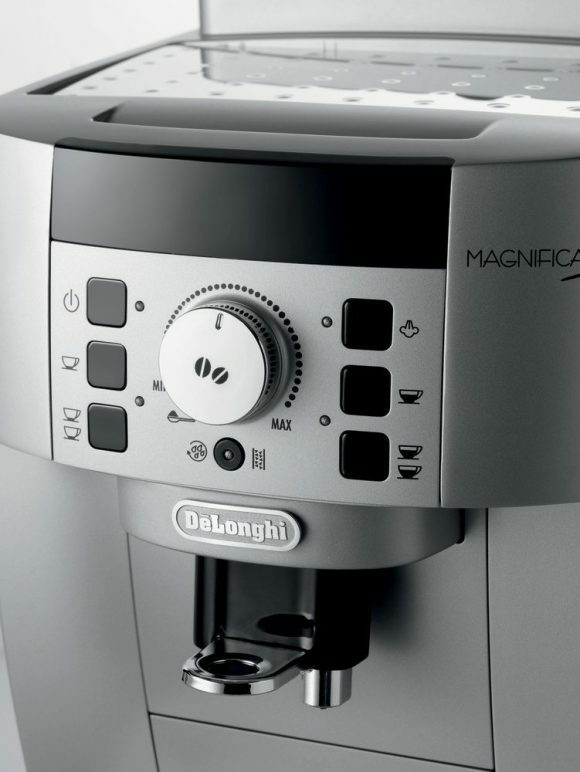 We absolutely love the DeLonghi ECAM22110SB Magnifica XS Espresso Machine. Not only does it take up little counter-top space, but it produces some of the best tasting drinks around. The silent conical burr coupled with the pre-ground compartment make it easy to brew drinks from your favorite beans or grounds. We especially like how intelligent this machine is. It gets extra brownie points for being able to remember our past settings to brew an identical drink in the future. Overall, this is certainly a unit worth considering if you’re in the market for an espresso machine. 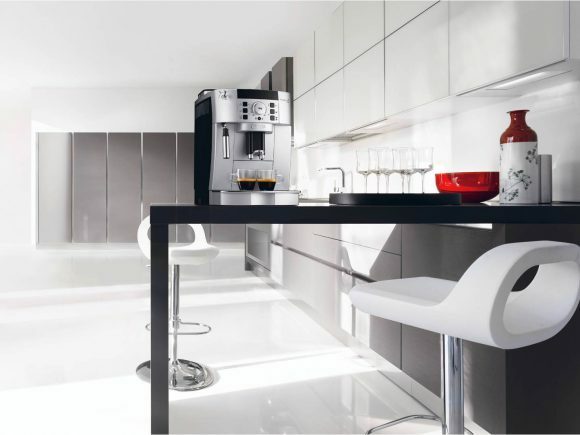 DeLonghi has outdone themselves once again with this spectacular unit! We hope you enjoyed our DeLonghi ECAM22110SB Review. Please feel free to share or leave comments below! I just recently discovered your blog, and I really like it. 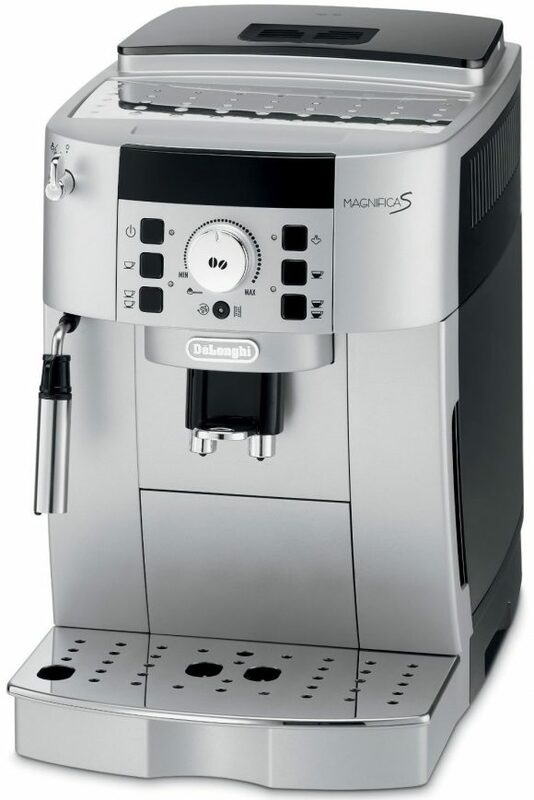 This magnifica xs machine looks like a great choice for our household! It’s gotten good reviews and your positive feedback gives us further confidence in buying. Thanks for the input to us. We can’t wait to get it! We know you will love the machine. It’s a top-notch product and will serve you well for years to come! I really like the way the site is set up and how you have views from all perspectives like a general product rating and even Amazon’s consumer ratings. The colours and site layout is also easy to look at and easy to maneuver so that was engaging too. Thanks for the kind words. We appreciate it! You will definitely enjoy this machine. Currently it’s selling for around $700 which is a decent value compared to other machines from the likes of Jura which cost multiples of this one. Love that this machine can adjust the strength of your coffee. I like it strong and often it’s too weak for me. Also living in a small apartment the compactness of the Delonghi ECAM is definitely a plus. I also love that it saves your settings so that once you find that perfect mix you can save it and have a consistent drink every time. In fact I think this has everything that I need from an espresso machine – looks pretty nice too. Can you just produce frothy milk from the machine too (without coffee) if you wanted to? You can absolutely produce froth without brewing any drinks. This is a fabulous machine and we are sure you will enjoy it. Especially given your space restriction.